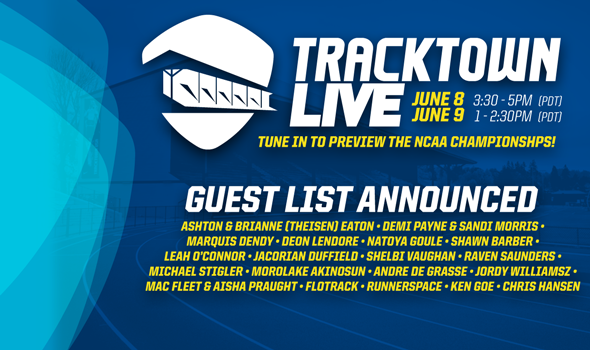 NEW ORLEANS – A star-studded lineup of guests has been announced for the second annual “TrackTown LIVE” NCAA Outdoor Track & Field Championships preview webcast on Monday, June 8, and Tuesday, June 9, from Eugene, Oregon – the site of the Championships on June 10-13. A group of 14 current athletes who have combined for 18 career individual national titles will be joined on TrackTownLIVE.com by “Track & Field’s First Couple” from the Oregon Track Club Elite: decathlon world record holder/Olympic gold medalist/five-time NCAA champion Ashton Eaton and Brianne Theisen-Eaton, who herself is a six-time combined event NCAA champion/two-time world runner-up. NEW: Omar McLeod of Arkansas, reigning indoor 60-meter hurdles champion & collegiate record holder, and top contender for outdoor 110-meter hurdles title. The “Year of the Vault” duo of NCAA pole vault indoor champion/outdoor record holder Sandi Morris of Arkansas and indoor record holder Demi Payne of Stephen F. Austin, who have combined to break collegiate pole vault records seven times in 2015. Five-time NCAA long jump/triple jump champion Marquis Dendy of Florida. Two-time 400-meter champion and reigning Bowerman Trophy winner Deon Lendore of Texas A&M. Three-time 800-meter champion Natoya Goule of Clemson. Two-time pole vault champion and indoor collegiate record holder Shawn Barber of Akron. Defending indoor mile and outdoor steeplechase champion Leah O’Connor of Michigan State. Reigning indoor high jump champion JaCorian Duffield of Texas Tech. Reigning indoor shot put champion and frosh phenom Raven Saunders of Southern Illinois. Defending discus champion Shelbi Vaughan of Texas A&M. Two-time 400-meter hurdles national runner-up Michael Stigler of Kansas. Women’s 100- and 200-meter national title contender Morolake Akinosun of Texas. Men’s 100- and 200-meter national title contender Andre De Grasse of Southern California. Jordy Williamsz of Villanova, the man who outkicked Oregon’s multiple-time national champion Edward Cheserek at the Penn Relays. Most athletes will be joined on the set by their coaches, many of whom will have their teams in the national team title hunt in Eugene. Stay tuned for a final time schedule. In addition to the Eatons, two-time NCAA champion Mac Fleet, formerly of Oregon, will also represent OTC Elite, along with Aisha Praught. Be sure to catch guest analysts from Flotrack and Runnerspace on Monday as they break down the competition and make their team and individual predictions. Tuesday will feature the local Oregon media duo of Ken Goe of The Oregonian and Chris Hansen of the Eugene Register-Guard – two of the nation’s foremost track & field journalists – as they offer their insights on the Championships. Each of the media members will be asked to “Pick The Champ” in several of the hot-button events and the team races. Fans can make picks of their own in the USTFCCCA’s “Pick The Champ” prediction contest. More information can be found here. The shows, which are a joint production of the USTFCCCA and TrackTown USA, will also be simulcast on USTFCCCA.org, Flotrack and Runnerspace. Swangard has been the lead public address announcer at historic Hayward Field for more than two decades, providing in-stadium commentary for University of Oregon home meets as well as previous NCAA national championships, the Prefontaine Classic, USATF national championships and the last two U.S. Olympic Track and Field Trials. In addition to his in-stadium announcing duties, Swangard also provides commentary for track and field broadcasts on NBC Sports Network and USATF.tv. Away from the track, Swangard is the Managing Director of the Warsaw Sports Marketing Center at the University of Oregon considered one of the world’s top programs for aspiring sports business professionals. Kent was a standout three-sport letterman at the University of Oregon, competing in football, basketball and track & field. A 2007 NFL draftee by the Seattle Seahawks, Kent was also a four-time USTFCCCA All-American on the track as a member of the school-record and NCAA-scoring 4×100 and 4×400 relays for the Ducks. His broadcasting career includes three years as studio host at Comcast Sportsnet NW for a variety of shows, and he has served as an in-studio analyst for NCAA and NBA basketball, NCAA football and USA track and field. The U.S. Track & Field and Cross Country Coaches Association (USTFCCCA) is a non-profit professional organization representing cross country and track & field coaches of all levels. The organization represents over 9,000 coaching members encompassing 94% of all NCAA track & field programs (DI, DII, and DIII) and includes members representing the NAIA as well as a number of state high school coaches associations. The USTFCCCA serves as an advocate for cross country and track & field coaches, providing a leadership structure to assist the needs of a diverse membership, serving as a lobbyist for coaches’ interests, and working as a liaison between the various stakeholders in the sports of cross country and track & field. TrackTown USA, Inc. is a non-profit organization committed to setting a standard of excellence in the sports of track and field and running by hosting premier events, creating a supportive environment for elite athletic performances, improving facilities and inspiring the next generation of track and field athletes and fans. The company is responsible for organizing the 2014 IAAF World Junior Championships, the 2015 USA Track & Field Outdoor Championships, the 2016 IAAF World Indoor Championships,the 2016 U.S. Olympic Team Trials-Track & Field, and the 2021 IAAF World Championships.